Last night The East London Federation of Suffragettes were appropriately remembered at the launch of the newly recreated Women’s Hall at the Tower Hamlets Local History Library and Archives. 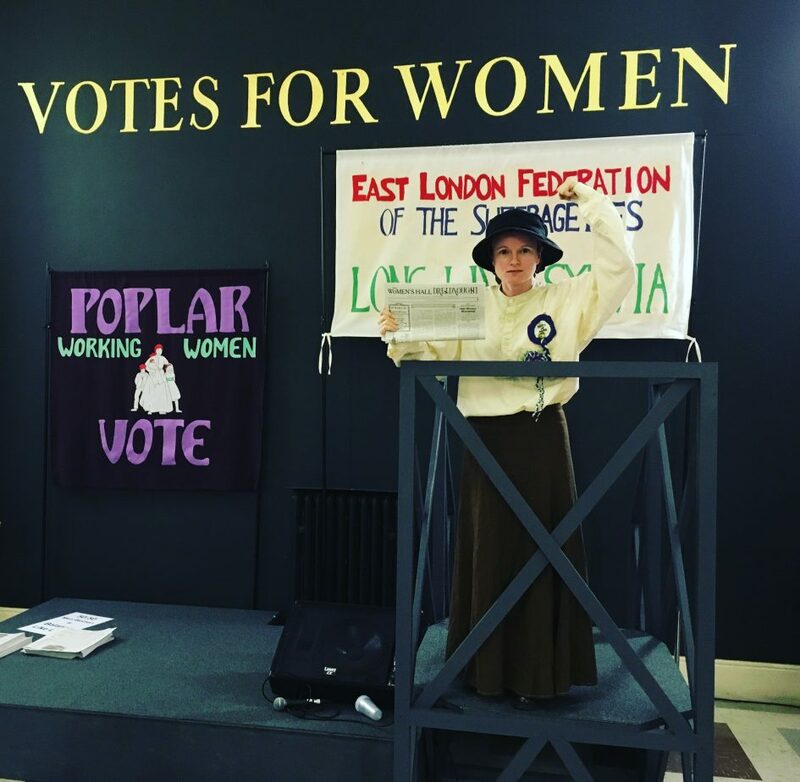 The lobby of the Grade II listed building, almost unrecognisable, had been transformed into a space to celebrate the home of Sylvia Pankhurst from 1914 to 1923 and tell the story of the East London Federation of Suffragettes (ELFS). Tamsin Bookey, Heritage Manager of the Tower Hamlets Local History Library & Archives and the woman who instigated the project, describes the above photo of Sylvia Pankhurst as being ‘our inspiration for all of this’. The photograph is of Sylvia outside the WSPU’s first head quarters on Bow Road, underneath the words ‘Vote For Women’ that she hand painted in gold before she separated from her mother and set up her own branch of Suffragettes. ‘We wanted to draw attention to the activities of the ELFS that Sylvia Pankhurst founded in what was then the metropolitan area of Poplar.’ Tamsin explains. ‘We want to reflect and imagine on the cost price restaurants that they set up, the free milk for babies and the jobs they created at the toy factory that helped East Enders out of poverty during the first World War. When developing our exhibition, it was very important to bring out the story of those individual residents of this area who heard what Sylvia had to say and joined in. They started the babies clinics, sold The Dreadnought, and paid membership fees and signed up new members and chained themselves to each other to try and evade arrest. Their names are not very well known so we highlighted 14 of them’. Tamsin announces the publication of ‘The Women’s Hall Dreadnought’ that includes more in-depth stories that the volunteer team of researchers uncovered and listings of events throughout the summer. In true ELFS spirit, a group of mothers interrupted Tower Hamlets Mayor John Biggs’ speech in a peaceful protest, standing in front of the platform where Mr Biggs stood holding up their banners, colourful letters spelling out ‘Save Our Nurseries’ in response to Tower Hamlets proposing to privatise the services on three specialist child day centres. The Mayor apologised for the outbreak ‘I don’t want this event event disrupted by a group of Labour Party Members who are campaigning. Very impolite of them to disrupt in this fashion’. A woman in the audience responded loudly ‘This is important, this is what it is all about, supporting women, it is what the ELFS would have been fighting for’. It seems that Mayor Biggs doesn’t know his history. Dr Helen Pankhurst, CARE International’s Senior Advisor and granddaughter of Sylvia Pankhurst described the activism at the launch as ‘amazing’ and later during her speech went on to say ‘There is a discomfort on what men’s role is and that is important. Men have to feel uncomfortable in this world. Us women know that feeling so well, so it is important that as we go forward we negotiate that and men’s viability and engagement’. I’m proud to live in Bow, a small part of London but a place so rich in history. I wanted to get involved with the Women’s Hall project from the start and signed up to be a research volunteer. I spent many hours in the reading room above the newly recreated Women’s Hall with many of my fellow volunteer researchers delving into the history of the individual ELFS members. I wanted to find out more about the immediate area between Roman Road and Old Ford Road. Why did Sylvia choose this address? Who were the people she was trying to help? Why were their situations so desperate? What events took place there? I spent hours engrossed whilst I sifted through cuttings files, searching through seemingly irrelevant photos until little nuggets of information were found; a photo of people walking the same streets as me but 104 years ago, a description of the congregation of nearby church St Paul, the exact address of the Gunmakers Arms that became the Mother’s Arms and realising that it is now a children’s playground and not where the commemorative plaque hangs upon a concrete wall. I can no longer walk along the stretch between the Hertford Union canal bridge and St Stephen’s Road without thinking that I am walking in the footsteps of the East London Federation of Suffragettes. All of us are here as we are interested in history as what it tells us about the present and what we have to continue to do. The most significant lesson this project has taught me is other than universal suffrage, many of the other issues the ELFS were campaigning for are still worth fighting for today. The Women’s Hall is open from today until 20th October 2018 at Tower Hamlets Local History Library & Archives, 277 Bancroft Road, London E1 4DQ. Thank you to all the Local History Library & Archive staff for their valuable advice and patience as I requested box after box of cuttings from the archives. 1 – 1.30pm Guided tour of the exhibition. 2 – 3pm ‘Forgotten Suffragettes’ talk by Esther Freeman. Sylvia Pankhurst and the East London Federation of Suffragettes were known to use their creativity to highlight their campaigns. Come along to our free drop-in workshop at The Women’s Hall led by Sarah Richards and learn how to make a posy in ELFS colours using upcycled fabrics. No sewing experience necessary and all materials provided. Led by Sylvia Pankhurst who chose East London as the starting point for her campaign for women’s suffrage, East End women were key to the success of the Suffragette movement. Seeing the plight of the working women and mothers, she also established a nursery, a series of restaurants and a toy factory in Bow. Join Rachel Kolsky, prizewinning tour guide and author of Women’s London and follow in Sylvia’s footsteps. Lots of events are taking place over the summer, including an August takeover by the local Somali cultural organisation, Numbi Arts. Find the full listings on www.womenshall.org.uk. When you visit the hall, please take a donation for the Bow Food Bank. The Women’s Hall is a partnership between Tower Hamelts, Idea Stores, Alternative Arts, Four Courners, East End Women’s Museum and thanks to the Heritage Lottery Fund.